As I had mentioned yesterday, I was a little disappointed with the newest Warm Soda 7". After knocking it out of the park with their full length earlier this year, I felt that the 7" was OK, but not anywhere near as good. 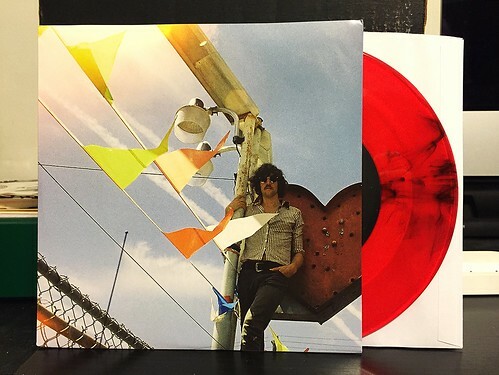 Today, we have Matthew Melton of Warm Soda's solo 7". This is also following up a solo LP that I enjoyed quite a bit, but just like the Warm Soda 7" from yesterday, these two new songs are something of a let down. I'm not sure what exactly is going on with these new Melton tunes, they feel so weirdly produced and so very, very 1980's. The recording has this swirling ambience that gives the songs an odd dream-like feeling. I don't really like either of these two songs. "Too Many Hearts Lack Lovers" covers Melton's often revisited topic of heartbreak. Typically, he wraps those discussions in a power pop coating that makes everything seem optimistic despite the breaking of the heart. This time, the song is just a major league bummer. I have about as much hope for the situation as I do after listening to "Sweet Dreams" by the Eurythmics. Which is to say no hope at all. On the B-side "Was It A Song" isn't quite as much of a downer, but it's kind of a throwaway song. It's a simple mid tempo song with a clockwork drum pattern and is just sort of there. I wouldn't say it's bad, but it's just not the sort of thing that really grabs your attention. It's kind of odd writing such a critical review of something Matthew Melton is involved in. He's done so much that I really love including releasing one of my very favorite albums of the year with Warm Soda. Unfortunately this 7" just doesn't work for me. Hopefully it's more of a blip on the radar than a sign of things to come.